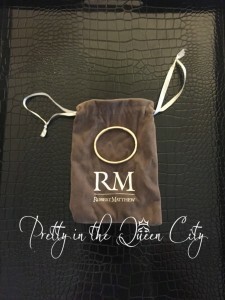 Congratulations to our Client Robert Matthew for their feature on Pretty in the Queen City! RobertÂ MatthewÂ was founded by two friends and designers with over 17 years of experience in the fast-paced world of fashion.Â What started as a love affair with womenâ€™s handbags soon spread, and their diverse line has grown to include everything from shoulder bags and totes to fashion scarves and elegant jewelry. Less is more in 2015, as showcased by the sleek earrings, bangles, and necklaces fromÂ RobertÂ Matthew. Theyâ€™ve incorporated smooth lines and gem-encrusted accents into each piece, giving them a sense of luxury that plays into the art of simplicity. Look poised and polished at your neck black-tie gathering! The Madison bangle, from Robert Matthew, is a lovely addition to your most formal attire and is sure to add some flare to an otherwise simple outfit.